Bathymetry of Lo`ihi volcano, just south of the Big Island of Hawai`i. Stars represent the locations of ocean-bottom seismometers deployed in September 2010. Lō`ihi volcano has its summit about a kilometer below sea level, 30 km south of the Big Island of Hawai`i. This active submarine volcano is the youngest expression of the Hawaiian hot spot and will one day be the next island in the Hawaiian chain. Although the petrology, vent chemistry and morphology of Lō`ihi has been studied for decades, its earthquakes and their relation to internal structure and eruptive processes remain poorly understood. This is largely due to the volcano’s location relative to the Big Island: Lō`ihi sits outside of the permanent seismic network operated by the Hawaiian Volcano Observatory (HVO). Thus Lō`ihi earthquakes are poorly located and only earthquakes over a substantial magnitude (~1.7) are reliable recorded. To address this issue, researchers from WWU and the University of Wisconsin—Madison are engaging in a study to investigate Lō`ihi earthquakes with a network of ocean-bottom seismometers (OBS’s; see the figure below). In this NSF-funded project, 12 OBS’s were deployed on and around the volcano in September 2010 and were retrieved in July 2011. Data from this project will help answer a large number of questions that remain about Lō`ihi. 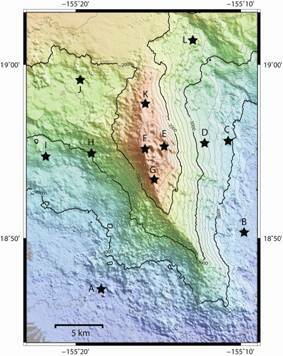 We hope to investigate where Lō`ihi’s earthquakes occur relative to its summit and rift zones. We hope to determine whether submarine volcanoes exhibit the same types of earthquakes (e.g. long-period events) that are observed on subaerial volcanoes, and how these events are related to fluid flow in the volcanic edifice. Seismic data from both Lō`ihi and the Big Island will be used to investigate Lō`ihi’s internal velocity structure and determine whether the volcano has a permanent magma reservoir, where rift zones are located, and where the boundary lies between Lō`ihi and its neighboring volcanoes Mauna Loa and Kilauea. 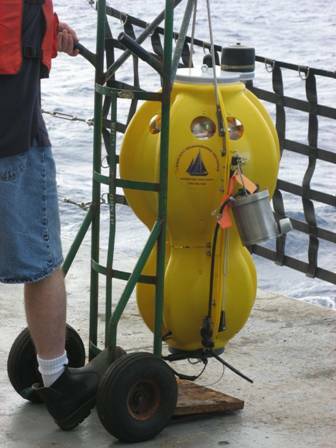 Other data collected on the deployment cruise include gravity and magnetics. 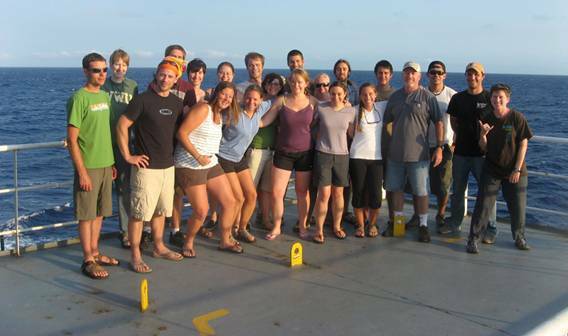 Analysis of these data will provide another view into Lō`ihi’s internal structure and may help constrain the relationship between the young seamount and the volcanoes that comprise the Big Island.